Halls, the maker of the menthol throat sweets, took to the streets of Johannesburg to drive awareness of its 'Own the Moment' campaign. 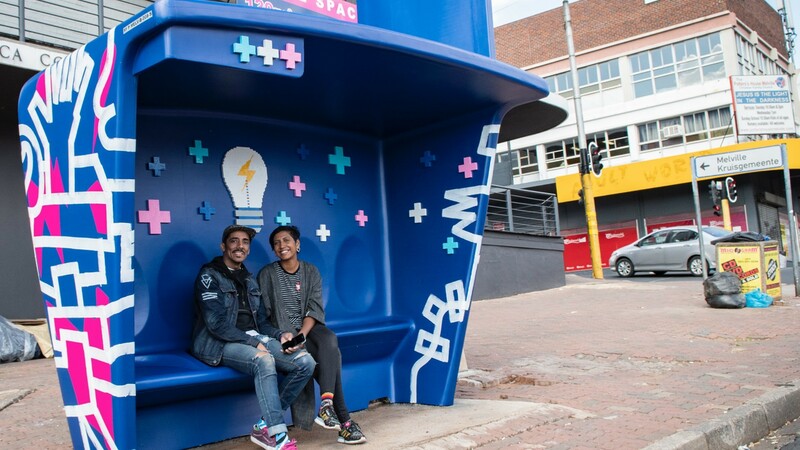 Halls partnered with Street Network, which saw the roll-out of a creative execution across eight bus shelters in Johannesburg that aimed to target daily commuters, with a specific focus on millennials ‘on the go’. According to Halls, its partnership with Street Network allowed it to select strategically located shelters that spoke to the target market and provided the canvas on which to communicate its message. The 'Own the Moment' campaign encouraged people from across the country to share their ‘happy moments’ via the Halls website for the chance to win R250 000. The moments were brought to life across the city with the help of creative studio Mrs & Mr Luke, which was engaged by Saatchi&Saatchi Cape Town on behalf of Halls South Africa. "We wanted to take the digital realm and bring it into the physical space, and the out-of-home medium was perfect for this," says Tyrone Beck, creative director at Saatchi&Saatchi Cape Town. "Also, we found that, as a result of the hype around the OOH pieces, the campaign developed its own ecosystem. Our target audience was driven to our social channels and then onto the microsite either by seeing them physically or via the artists’ posts on their social pages," adds Beck. Halls aimed to work with local artists to create a series of public works of art in Johannesburg as part of the broader campaign to 'Own the Moment'. Mrs & Mr Luke was given a ‘moment’ as the inspiration behind each bus shelter, which it then needed to interpret in its own styles. These moments took on themes such as: 'Waking up at 5 to fulfil my dreams', 'Forgot my bus ticket', 'Moved to the City of Gold' and 'Making time to make things happen'. Halls says Mrs & Mr Luke were given free reign to re-imagine each bus shelter, with the purpose of creating an all-encompassing experience inside and outside. This involved wrapping the bus shelters in bright, solid colours. One shelter was designed by artist Isabeau Joubert using a ‘yarn-bomb’, which is a type of graffiti or street art that employs colourful displays of knitted or crocheted yarn or fibre, rather than paint or chalk. The street furniture campaign was effective in reaching over 850 000 people and delivering 5.5 million impacts with an average frequency of seven. "This platform allowed for creative expression in a way that no other medium would be able to do," says Jonathan Everest, head of sales at Street Network. "Commuter shelters also allow for flexibility in terms of the size of a campaign, from directional branding on a single commuter shelter through to creating an outdoor art installation on a limited number of sites. Location also plays a vital role and, as such, the opportunities for street furniture are endless, limited only by the imagination and ability of the creative to deliver an effective message," adds Everest. In partnering with Street Network, Halls South Africa and Saatchi&Saatchi aimed to display how an effective and well-thought-out street furniture campaign can elevate a brand and captivate commuters in targeted high-traffic locations. For more information, contact [email protected] or visit www.streetnetwork.co.za.